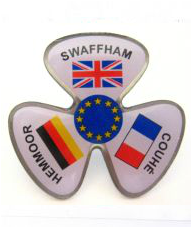 Swaffham Twinning Association's aim is to encourage communication and to foster friendships and understanding between the people of Swaffham and it's twinned towns of Couhé in France and Henmoor in Germany. Since that time civic ceremonies have been held in rotation in one of the three towns every two years to reaffirm the principles of twinning and bonds of friendship put in place in 1968. Civic occasions take place over a weekend and are usually marked by a formal ceremony on the Saturday in which the Mayors of each town renew the promises made all those years ago.In the evening there is a dinner, hosted by the town, followed by dancing and socialising into the small hours. Trips to local places of interest are arranged and host families also take their guests out and about on private visits.